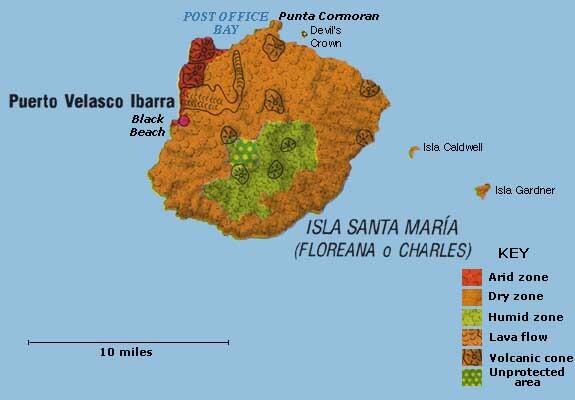 Floreana or Santa Maria Island is the sixth biggest island of the Galapagos. It is roughly rectangular, with sides about 10 x 7 miles long. The highest point is 2,100 feet. Its land area is 67 square miles. It is comprised a single volcano, which is inactive, probably extinct. The official name of Santa Maria comes from one of Columbus' ships but most people call it Floreana after President Juan José Flores of Ecuador. Previously the English had called it Charles in honor of King Charles II.